For well over a century, the modern skyscraper has provided an ingenious solution to high-density living and working - accommodating the greatest number of people in a building with a minimal footprint. In the contemporary context of drastic urban growth, its role can only gain in importance. The question is how to avoid past mistakes and how to conceive the tower as a positive component of an existing or newly created urban fabric. 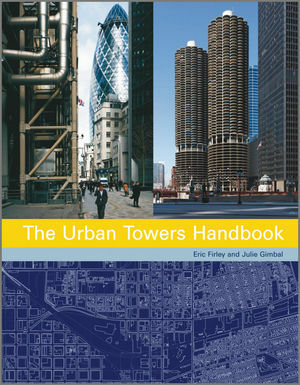 In a thoroughly analytical and comparative way The Urban Towers Handbook provides answers to these questions and serves as a reference book and design tool for architects, planners and developers alike. Its comprehensive graphic documentation includes not only aerials and to-scale plans and sections, but also purpose-made photography, drawings and diagrams. The core of the book is made up of over fifty case studies which have been classified according to three major typological groups and their respective sub-groups: solitaires, clusters and vertical cities. Twenty-one of these examples feature detailed documentation, including classics such as the Rockefeller Center in Manhattan and Torre Velasca in Milan, as well as contemporary milestones such as Roppongi Hills in Tokyo and the making of Sheikh Zayed Road in Dubai. Among others, several districts in Hong Kong, Shanghai and São Paulo have been analysed as existing examples of vertical cities. The case studies section of the book is consolidated by a second section that outlines high-rise regulations in seven cities around the world, and highlights how planning authorities use tall buildings for the realisation of their urban goals and visions. The third and final section of the book addresses the uneasy relationship between high-rise structures and sustainability, placing the emphasis on the urban implications. Eric Firley is a French-German architect and urban designer. The author of The Urban Housing Handbook (John Wiley & Sons Ltd, 2009), he is Assistant Professor at the University of Miami School of Architecture and heads an international research consultancy. Julie Gimbal is a French art historian with a special interest in high-rise architecture. She holds a doctorate from the University of Rennes on the subject of high-rise architecture in France and is responsible for the second section of the book on high-rise regulations. She also helped to inform the choice of case studies in the first part of the book. Philippe Honnorat, a French Engineer, heads the Paris office of WSP Flack + Kurtz. An expert in Mechanical and Electrical systems, he has worked in the UK and USA, and has extensive international experience in high-rise structures. Honnorat wrote the third section of the book covering sustainability issues.